Church College of Pesega dominated the 2018 B.S.L. 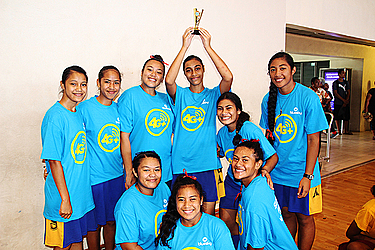 and Bluesky Samoa Schools Netball Champ of Champs, which concluded yesterday. Held at the National University of Samoa Gymnasium on Thursday and Friday, Church College of Pesega won both the intermediate division as well as the senior girls division. Church College of Pesega survived a tight contest final against sisters from the Savaii, Church College of Vaiola, winning 11-8 at fulltime. Mata’evave College from Savai’i claimed the Junior Girl’s division first prize and their goal attack, Ruta Lagi, scooped the best junior player of the tournament award. President of School’s Principal Association and Avele College Principal, Matafeo Reupena Matafeo, acknowledged all the efforts and hard work put into making the event a success. He said the tournament this year was possible through the hard work of Samoa Secondary Schools Principal Association, Netball Samoa as well as the naming rights sponsors of B.S.L. and Bluesky. Marketing Manager of B.S.L, Leeroy Feaunati says they are very excited to be part of this event together with Bluesky and Samoa Netball. Feaunati believes this is one of the initiatives by B.S.L. to give back to their customers, especially the schools. Other College’s from Savai’i who also did well in the tournament included Alofi o Taoa College who came third place in the senior girls division, Amoa College came fourth in the junior division, as well as Don Bosco School coming third in the intermediate girls competition.